In response, Author and publisher Ian Wishart has confirmed the book will go on sale in New Zealand through the website http://www.ianwishart.com and through some independent bookstores. The book will also be available to bookstores throughout Australia, the United States and Britain, through our international distribution channels. "Freedom of speech died in New Zealand today," said Wishart, "and ordinary New Zealanders should be very afraid when a protest by 0.5% of the population of four million people can dictate what books you are now allowed to read. "It won't change the final outcome, however. The book will be published, Macsyna's story will be told, and then people will see first hand how they were duped by Facebook website." The Facebook page on Macsyna King is dishonest. They have known all along that Macsyna has neither sought nor been offered any money or compensation for the book Breaking Silence by Ian Wishart. Still, the anonymous woman behind the Boycott Macsyna site continues to peddle her claim, knowing it to be untrue. Thousands of other commenters on that site have also made erroneous statements, often from ignorance (one of the things the book aims to correct). An example is the oft-repeated claim that after going to the doctor's and being told to go to hospital, that Macsyna and Chris Kahui instead went to McDonalds. They did not. They had stopped at McDonalds on the way to the doctor. Macsyna had been told by Chris that there had been a breathing incident the night before but that the twins were alright. This was now a number of hours later. It wasn't until they got to the doctor that Macsyna realised there was something wrong. When the doctor told her to take the children to hospital, she thought it best to grab fresh nappies and their medications and Plunket books. Chris Kahui was driving, but sprinted away from the car leaving the injured babies alone in the back seat while Macsyna was getting their Plunket books. This is a tiny part of the book. There is much more that sheds light on the events leading up to and following the deaths. There is now a Facebook page in support of free speech and your right to read books...If you don't like being told what you are allowed to read, visit that site. Mann, Ramstorf and other 'usual suspects' have released their 'it's worse than we thought' sea level "study". Looking back in history, the researchers found that sea level was relatively stable from 100 BC to AD 950. Then, during a warm climate period beginning in the 11th century, sea level rose by about half a millimetre per year for 400 years. That was followed by a second period of stable sea level associated with a cooler period, known as the Little Ice Age, which persisted until the late 19th century. A groundbreaking study of sea levels on the Israeli coast has revealed dramatic ups and downs repeatedly over the past 2,500 years. To coincide with the release of Air Con Climategate Edition on Kindle, there's been a stunning announcement today that we appear to be seeing major changes in the Sun, of a type that heralded the Little Ice Age. WHAT’S DOWN WITH THE SUN? mid-latitudes and migrates towards the equator. 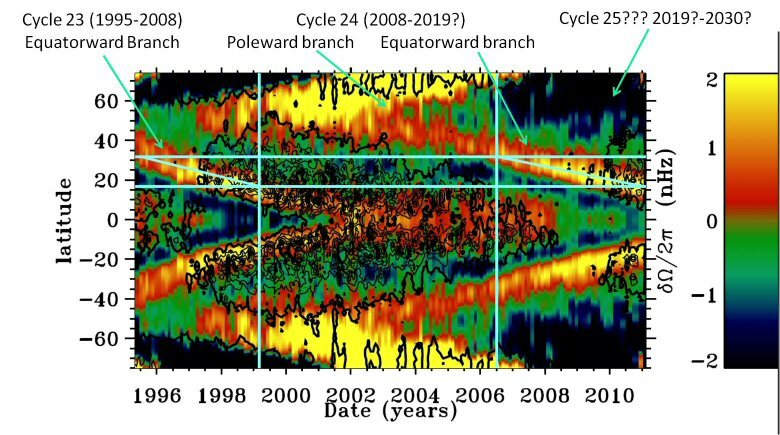 The latitude of this wind stream matches the new spot formation in each cycle, and successfully predicted the late onset of the current Cycle 24. (Earth’s magnetic field is less than 1 gauss at the surface); the field must reach at least 1,500 gauss to form a dark spot. 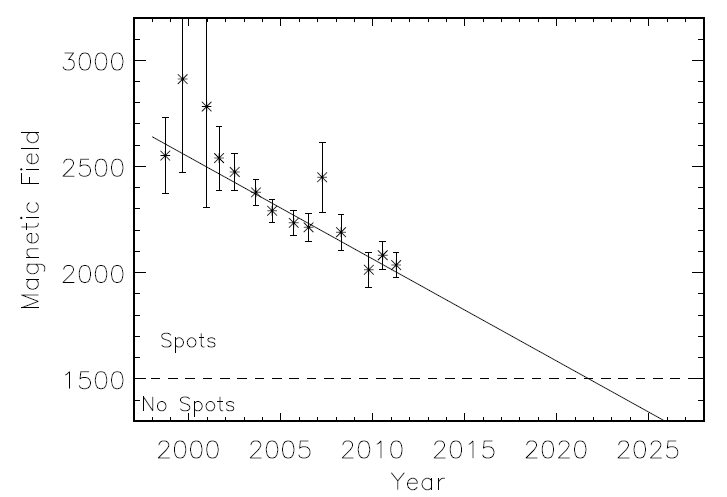 Average magnetic field strength in sunspot umbras has been steadily declining for over a decade. The trend includes sunspots from Cycles 22, 23, and (the current cycle) 24.
spots will largely disappear as the magnetic field is no longer strong enough to overcome convective forces on the solar surface. These results have been presented at the current meeting of the AAS/SPD. J. Schou & M. J. Thompson. 18.04: “Whither Goes Cycle 24? A View from the Fe XIV Corona” by R. C.